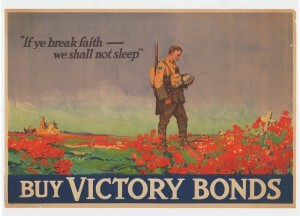 In 1964, fifty years following the start of the First World War, the Canadian Broadcasting Company (CBC) aired the seventeen-part radio series In Flanders’ Fields. Now, at the centenary of the Great War, the CBC has again leaned upon this series as one of its programming highlights to commemorate the anniversary. In Flanders’ Fields recently re-aired as The Bugle and the Passing Bell. The series was re-edited into ten, half-hour radio programs. While each episode had a brief introduction by host Beza Seife, essentially the programs relied upon the same information and oral histories presented in 1964. A comparison of the raw interview transcripts with the on-air programs makes these flaws strikingly clear. Raw transcripts reveal interviewers frequently committing blatant transgressions that compromised the integrity of the interviews. For example, interviewers would often talk over their subjects, substituting their own knowledge in place of a veteran’s account. In one interchange, an interviewer suggested to Gregory Clark, a Major with the Fourth Canadian Mounted Rifles and a Military Cross Recipient, that a wave of cynicism and resentment towards veterans had engulfed Canada in the postwar period. Clark disagreed with that assessment, yet the interviewer remained insistent that it was a period of strong anti-war sentiments in which no one wanted to hear about the war. In his insistence the interviewer failed to take Clark’s interpretation of events at face value. In cases where veterans had no memory of events, the raw transcripts show interviewers clearly overstepping their role and going so far as to tell veterans what had happened to them on certain occasions. For example, A.D. McEtheren was asked what he remembered of the battle at Neuville-Vitasse. When McEtheren freely admitted to remembering very little of it, the interviewer proceeded to tell him the actions the battalion was involved in rather than simply moving on to another topic. In its latest iteration The Bugle and the Passing Bell has undergone some significant changes. Condensing the original seventeen one hour long episodes into ten half hour long programs necessitated the cutting of material. Entire episodes, including those on military tactics and the aftermath of the war, have been cut. Other previously stand-alone episodes, including ones on the Battles of Vimy Ridge and Passchendaele, have been condensed into a single half hour. These changes have resulted in certain topic areas lacking sufficient context or background information. For example, while the episode on the Somme addresses the experience of the Newfoundland Regiment, there is a failure to adequately explain Newfoundland’s colonial status at the time of the First World War, or the impact of the losses on the colony – all areas where a present-day listener might potentially need information. In addition to the issue of context, the revamped series is also interesting in that the “lions led by donkeys thesis” has been significantly watered down. While this theme was central to the original broadcast, in the current iteration of the program the idea appears, but much more intermittently. This may simply be the result of shorter programs that incorporate less quotations and narration, or it may be a conscious effort on the part of series producers to reflect a changing narrative of the war, and to focus more on the Canadian experience and less on the issue of British leadership. As it stands, the updated series continues to suffer from the original flaws of its predecessor in that it incorporates the same oral history clips from the original program and fails to incorporate any new quotations from the original interviews that offer an alternative view of the war, or more accurately reflect the content of the 1964 interviews. The updated series, in its edits, has abandoned some of the old one-sided paradigms, but these same edits also contribute to a lack of context, and a program without a strong viewpoint. The biggest improvement to the series could have come from reinforcing the fact that this was a program originally released in 1964, and drawing on that to explore facets of war and memory and the evolution in our understanding of the First World War. In that respect, the episode titled, “The Aftermath” from the original series, which was cut from the modern version, may have been the perfect opportunity to explore the changing social memory of the war in Canada. While the original episode explored how the war had impacted Canada fifty years on, a new program, showing how this changed with the addition of another fifty years, and without surviving veterans in our presence, could have provided an interesting contrast and a platform to discuss the continuing evolution of our understanding of the war in Canada. Teresa Iacobelli is a SSHRC postdoctoral fellow at Queen’s University and author of Death or Deliverance: Canadian Courts Marital in the Great War. Her current research focuses on issues of memory and pedagogy. Well, this post really opened my eyes and I thank you for writing it. I listened to the extended version of Bugle and the Passing Bell on iTunes last year (45 minutes for each episode, instead of 25 minutes) and I was deeply impressed. The quality of the audio, the astuteness of the people interviewed, and the overall construction of the series, made it one of the best radio documentaries I’ve heard in years. However, I had no idea that the source material had been shaped, manipulated, and distorted so badly in 1964. The program makers back then were clearly guilty of tremendous ethical sins that would not be permitted in the current CBC. Unfortunately, none of this was brought out in the updated version, and as brilliant as the production was, I really feel that the whole thing is so badly tainted that it should be withdrawn. Either that, or a section should be added to the series to reveal just what went on with the 1964 production.